Woops… I have had a little mishap. I accidentally deleted all the photo’s for the “how to” of this delicious meal. 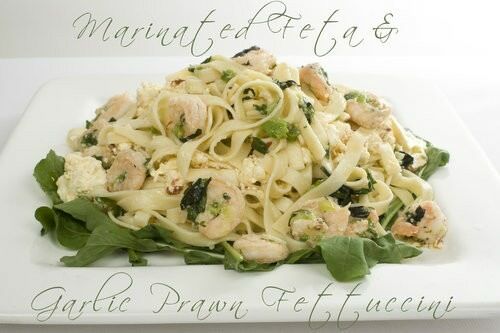 Trouble is, the Garlic Prawn Fettuccini tasted so delicious I really had to share it with you anyway. It is a super quick dish to make which I thought was ideal for this time of year. I know our household gets very busy leading up to Christmas, so I am always happy for a quick fresh dish. Can I also be a bit cheeky and say that the rocket, shallot and basil were all from my garden so it was straight from the garden to plate. Beautifully fresh! On a serving platter place a bed of rocket leaves. Bring a saucepan of water to the boil for the fettuccini. Add the fettuccini when boiling, and cook until al dente. Drain the marinated feta from the oil and reserve the oil for later use. When the fettuccini is almost cooked, sauté the shallot and garlic in the oil reserved from the marinated feta in a non-stick frying pan. Add the prawns to the shallots and cook briefly until they are just coloured. Turn off the heat to the prawns, and add the basil leaves, stir through. Drain the pasta and return the fettuccini to the cooking pot. Pour over the garlic prawn and herb mixture and stir though briefly. Add half of the feta and mix. 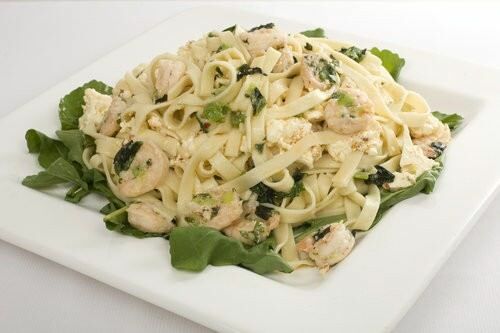 Place the pasta on the bed of rocket and add the remaining feta to the mixture. Squeeze some lemon over the dish and serve with extra wedges of lemon. * The marinated feta I used was the High Valley marinated Chili & Feta from Mudgee. The chili added a gorgeous taste to the dish so I would recommend this brand, or else sauté two birds eye chilies whilst sautéing the shallot.